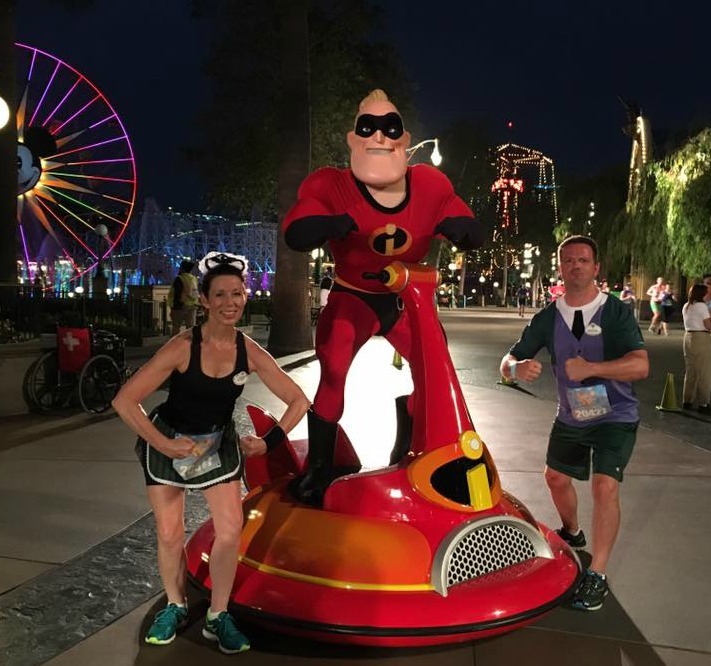 The theme for this year’s Disneyland Half Marathon Weekend was “dynamic duos,” and while we are more than a duo, the precipice for my desire to run this weekend was for the opportunity to be reunited with my Joyful Miles cohorts. Well, that and the lure of a Coast to Coast medal. That was really my only expectation. 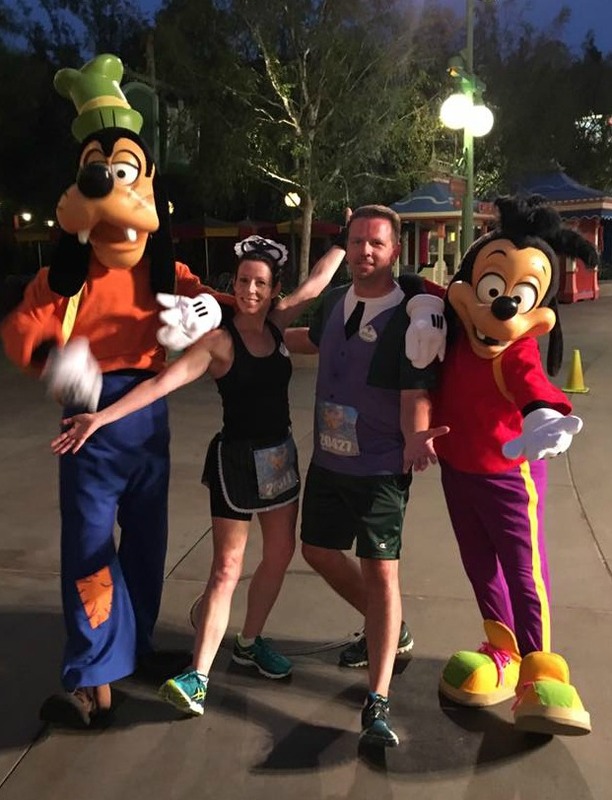 I had been to Disneyland only once before, and thought, “It’s okay, but it’s no Florida.” That sentiment carried over with my expectation of Disneyland’s version of a race. Little did I know that both preconceptions would prove most egregious, and this idea of “one and done” certainly would not last long. 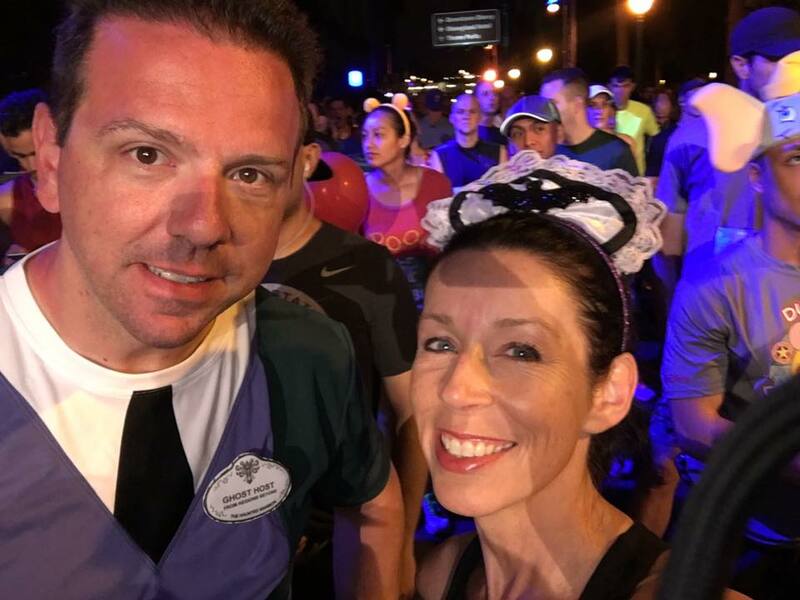 After perusing through the expo, and sleeping in while Jackey and Laura ran the 5K, the time came for me to don my running shoes (I love that we refer to them as shoes, where non-runners simply call them sneakers) and head towards the corrals. 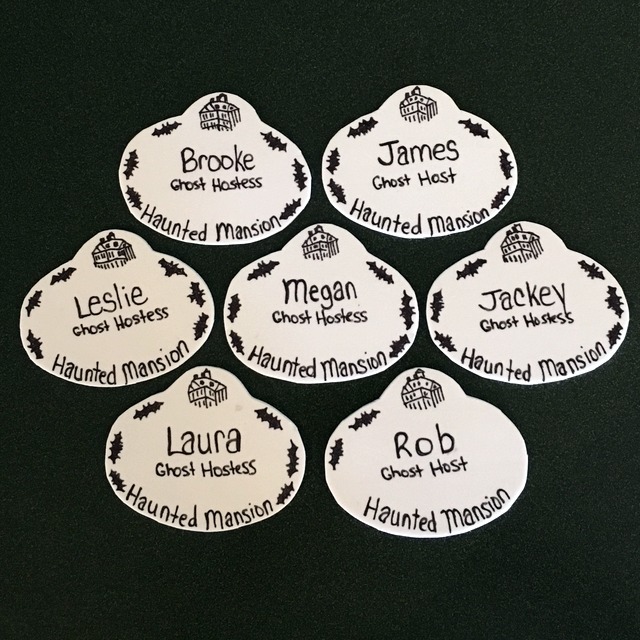 I was rooming with my friend James at Disney’s Grand Californian, which was really lovely, and the differences to Florida were immediate: We didn’t have to wake up at 2am to catch a bus! I cannot tell you how great this is! 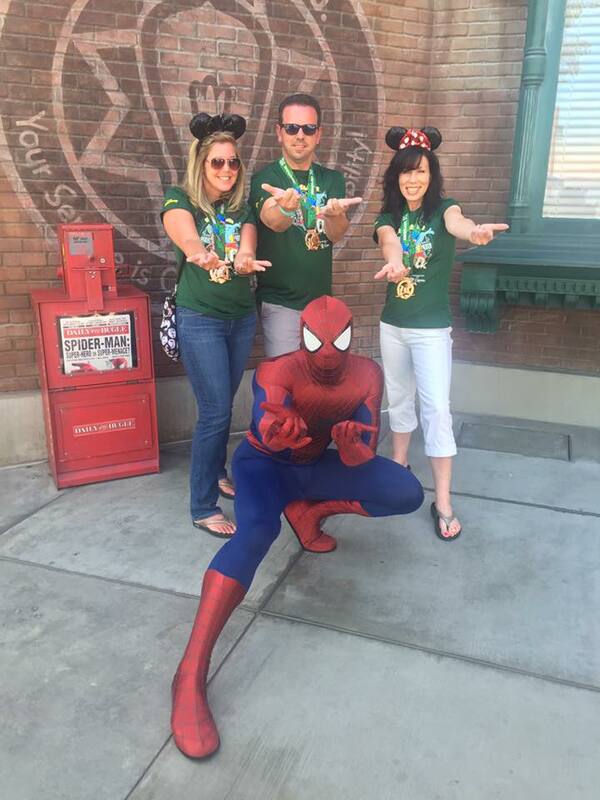 Regardless of which hotel you are staying at while at Disneyland, odds are, you are within walking distance. 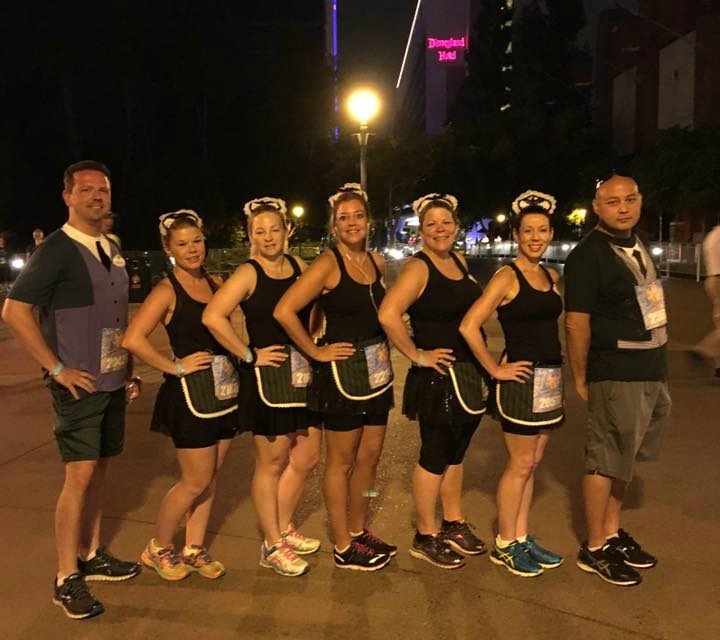 The plan was to meet up with the girls at 4:30 (race started at 5:30), and naturally, they weren’t on time. I’m always amazed by how these girls constantly squeeze 4 or more girls into a room with only one bathroom, and can’t figure out why they can never get anywhere on time. 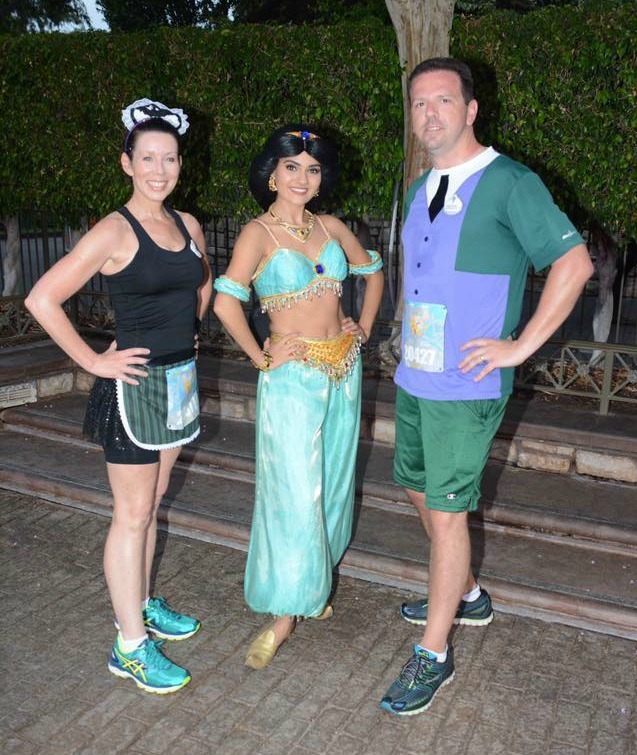 Anyway, it was only ten minutes past our meeting time that everyone showed up and we were able to get some pre-race photos all decked out in our running costumes. I’m a few bats short of a belfry…. the gents as butlers. Everyone made their own costume except for me. Pressed for time, and due to lack of ability, I weaseled out and bought my shirt from iglowrunning. 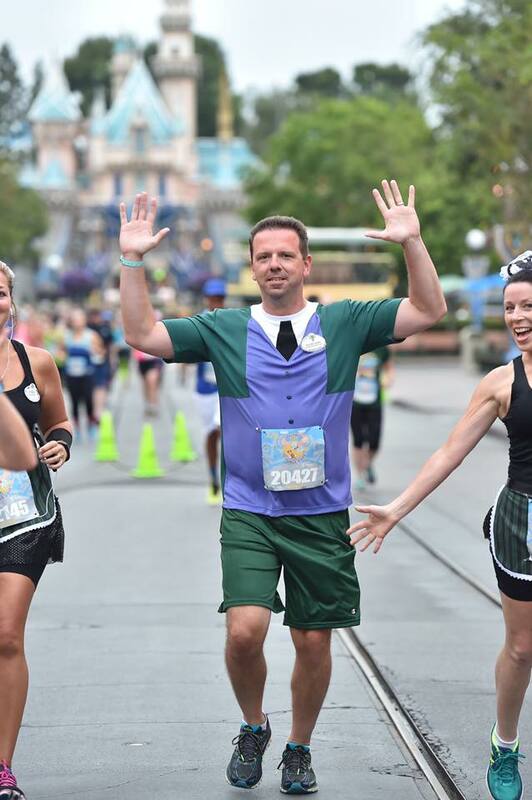 I was very impressed by not only the fact that the shirts I bought looked good, but they were actual running material that felt comfortable. As an added bonus, my Haunted Mansion shirt came with a name badge, which worked out since Laura had issues with making mine (and by “issues,” I mean one too many Bud Lights). Their stuff is not cheap, but they come highly recommended from your favorite celebrity blogger! 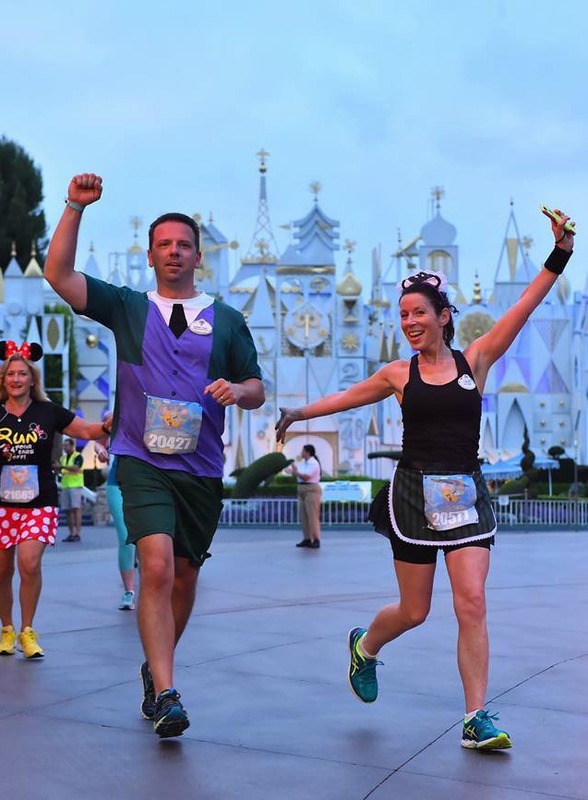 If you are used to Walt Disney Resort races, you are used to a festive pre-race atmosphere. That isn’t so with Disneyland’s version. Yes, there is a stage with a DJ and some activity. 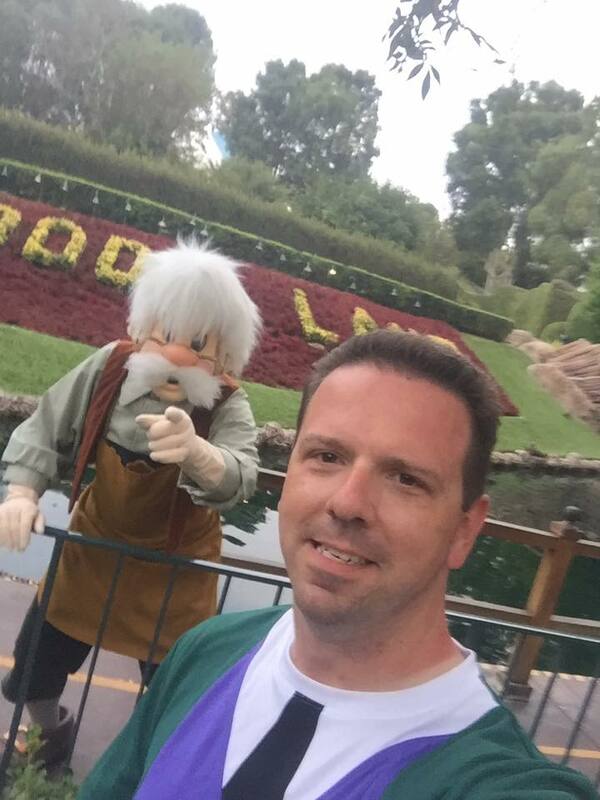 However, there aren’t any characters to grab photos with, and it actually felt kind of empty. Even the port-o-potties had manageable lines. After a few photos, we said our goodbyes and good lucks, and headed to the corrals. Laura and I were heading to corral A, which was very exciting as this would be the first time I got to actually start from A. The first thing we noticed was how strict security was at the corrals. Guards were scrutinizing everyone’s bibs to ensure they were going to the correct corral, and we had to pass a security stop at each corral. There would be no corral jumpers this weekend! 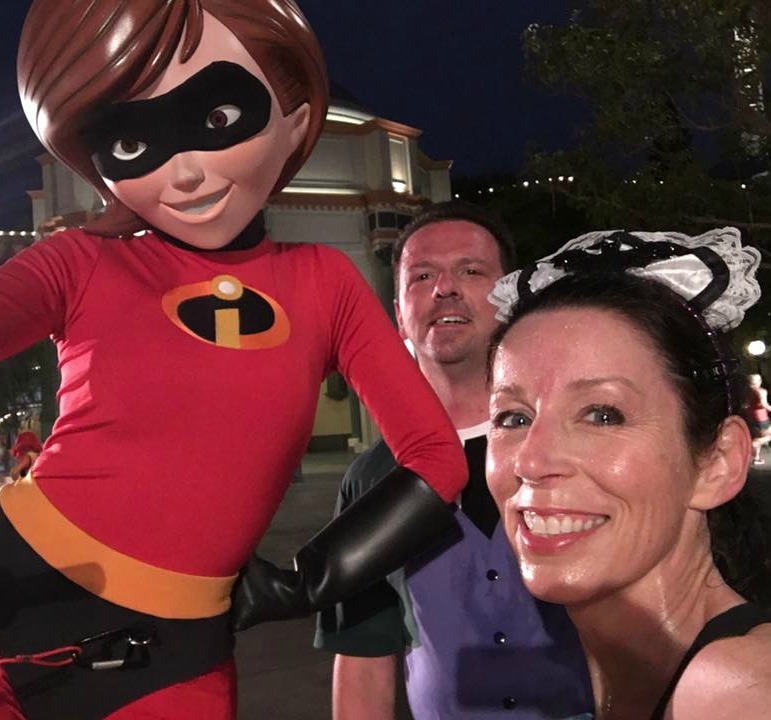 Once we settled in, we had to take the obligatory corral selfie: Recapping the awesome @rundisney Disneyland 10K #Disneyland #werunsocial #runchat Click To TweetThen it was time for our announcers to take the stage and kick things off. 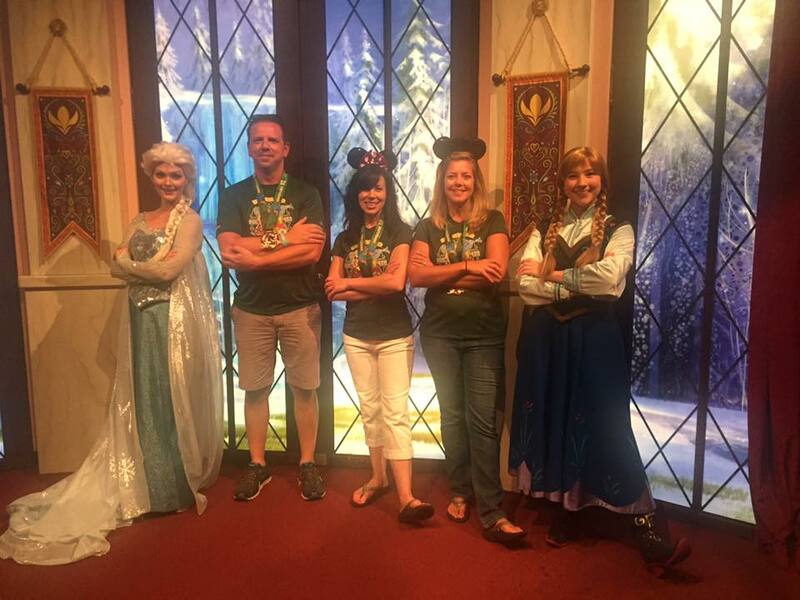 I don’t want to harp on this, but we were very underwhelmed by this weekend’s announcing crew. We are used to having John Pelkey and Rudy Novotny fire us up before we get started, but neither were present this weekend. The announcers that were there were very awkward, and the material was heavily scripted, which just didn’t play very well. Also, we did not get any of the inspirational stories that we are used to, and instead got a very heavy dose of corporate advertising. I know the sponsors pony up big bucks for these things, but I hope this isn’t becoming the new normal. 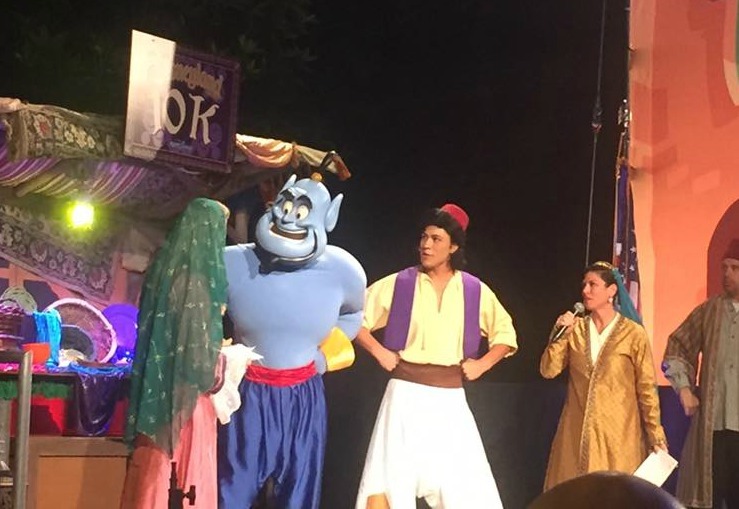 Finally, Aladdin and Genie joined the stage to kick us off, since the 10K was themed after them. The next difference came with the start, when after we were told to go, there wasn’t any fireworks to help send us off. In fact, there wasn’t much of any fanfare, we just started. 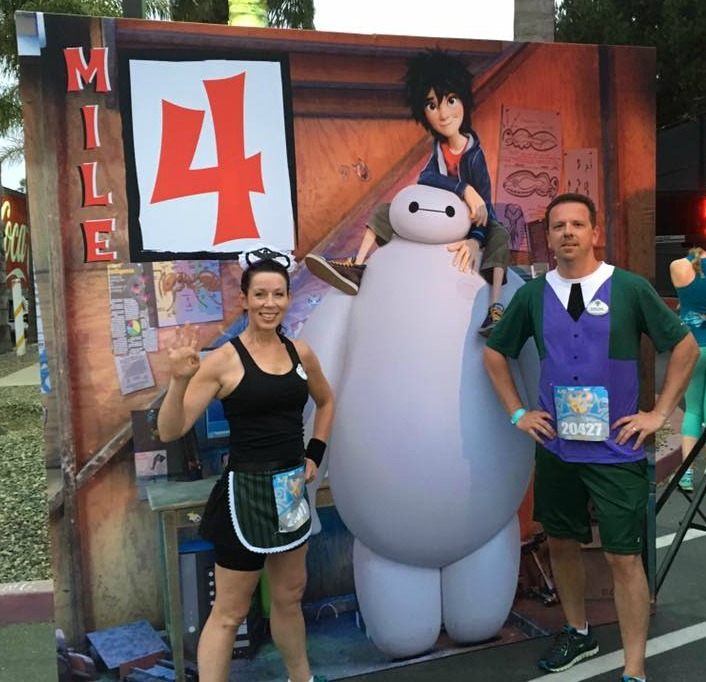 The start of the race is just outside of the Downtown Disney and Disneyland Hotel area, and kicks you out onto the streets of Anaheim. 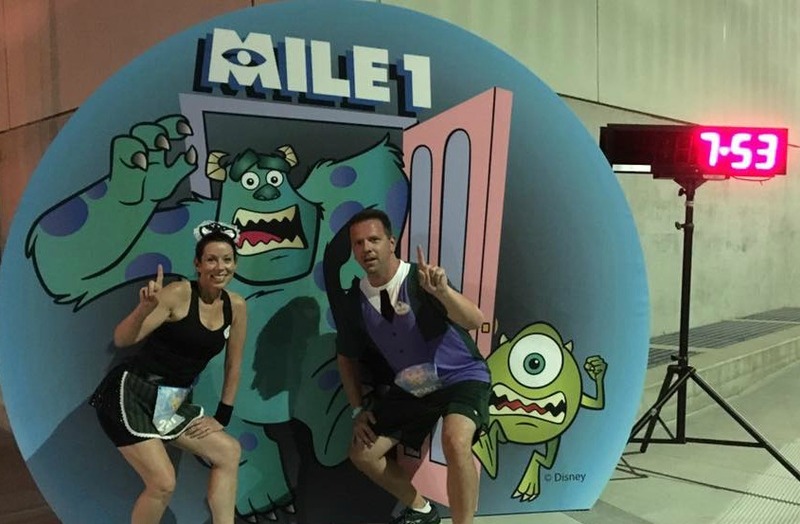 We wound up to the Convention Center, and looped around into a back entrance to Disney’s California Adventure, where we found our first mile marker. 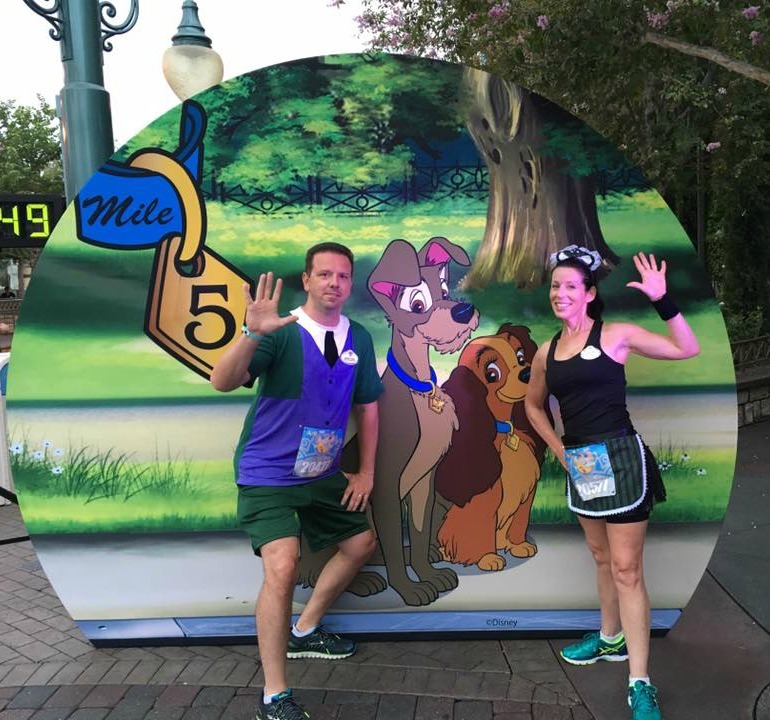 Since we started in A, this is the first mile marker at a runDisney race that displays my actual time, and as you can see, we were booking it. However, now that we were entering the parks, it was time to slow it down. 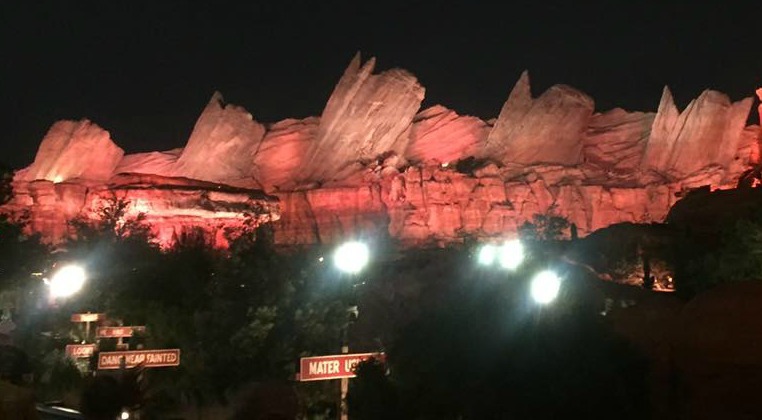 Especially where the first land you enter is Cars Land, which is just magnificent to experience, especially in the dark. 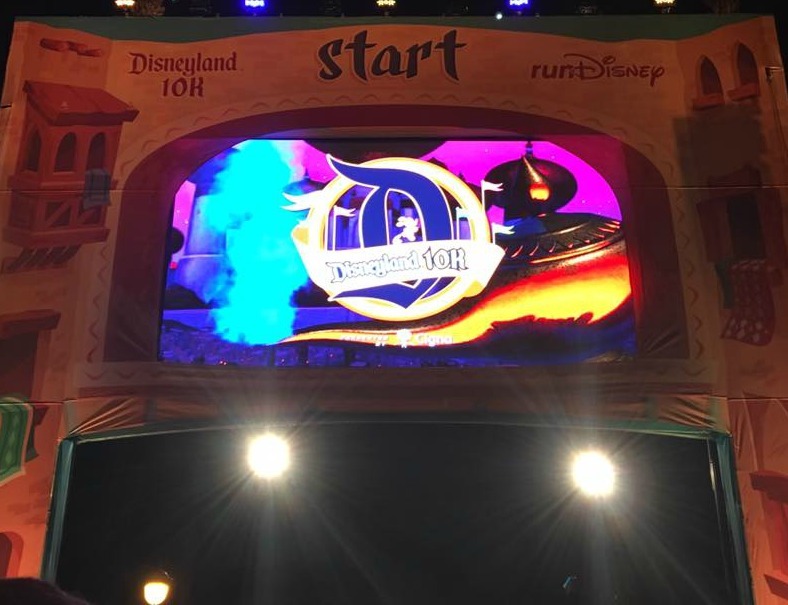 This area all lit up, with the World of Color fountains going, and lots of the rides running was just awe-inspiring. I could have spent hours just soaking it all in, and we actually did walk through most of it. 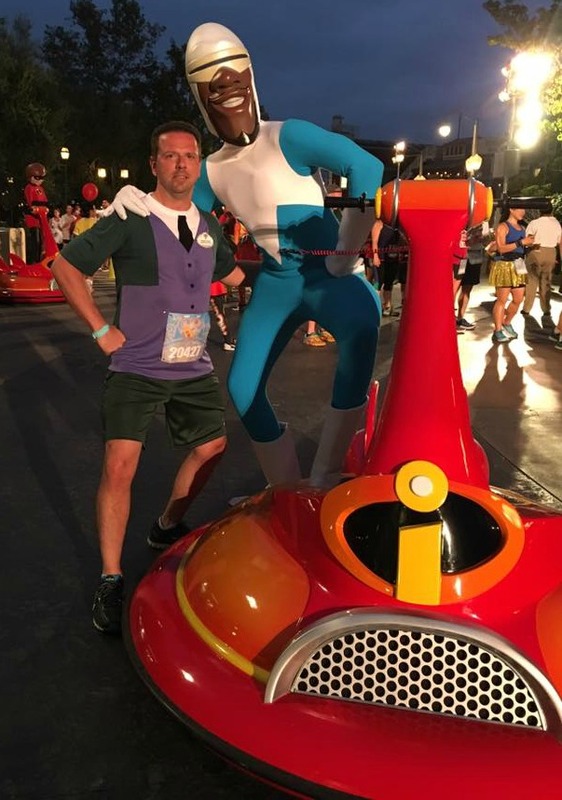 Before entering the boardwalk area, Mr and Mrs Incredible, along with Frozone were meeting for photo ops. 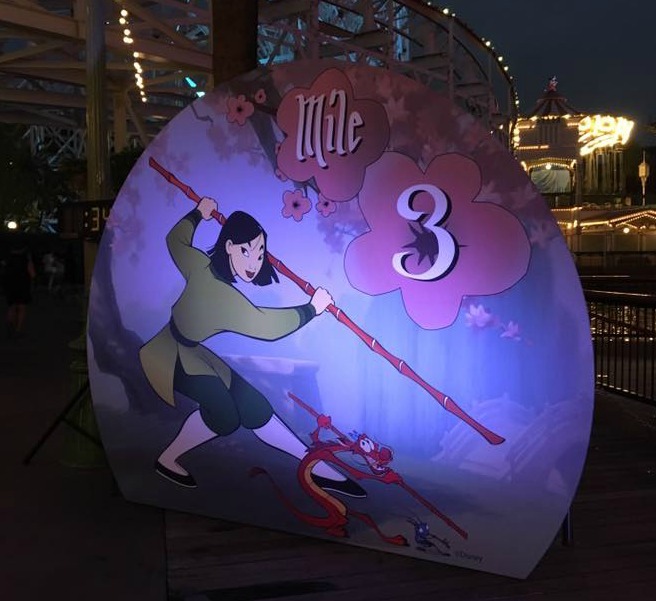 As we came around we would stumble upon Mile 3 (if you look, you’ll notice it took us roughly 27 minutes to get through Cars Land and half of Paradise Pier) as well as Goofy and his son Max, so we had to stop! 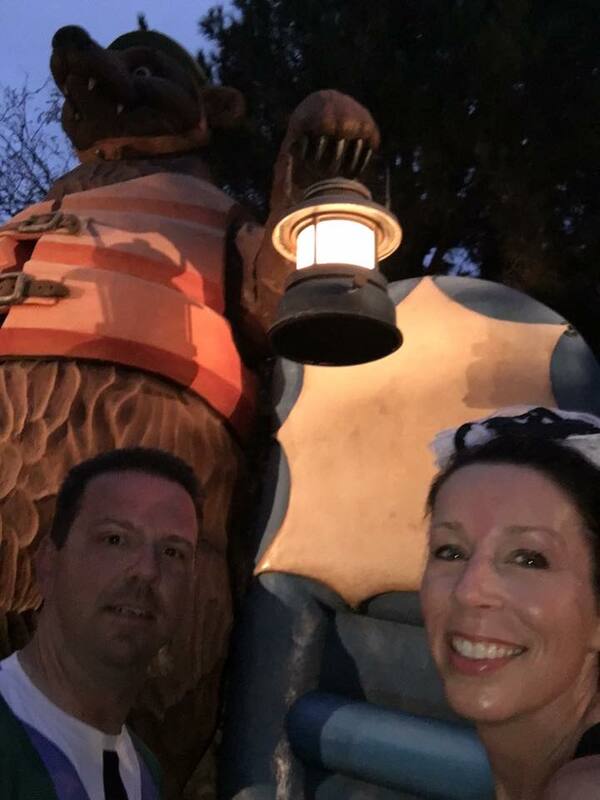 Reluctantly, we bid adieu to Paradise Pier, and exited through the Grizzly Peak area of the park, which I also love! 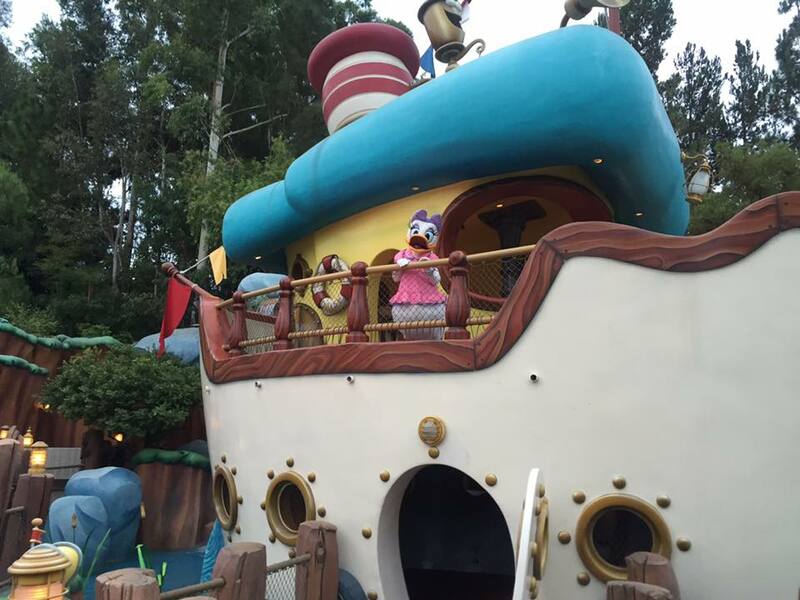 This is also a great spot if you want a real bathroom, which are few and far between in Disneyland. So our tip is, know where the bathrooms are going in, otherwise you’ll probably miss them. 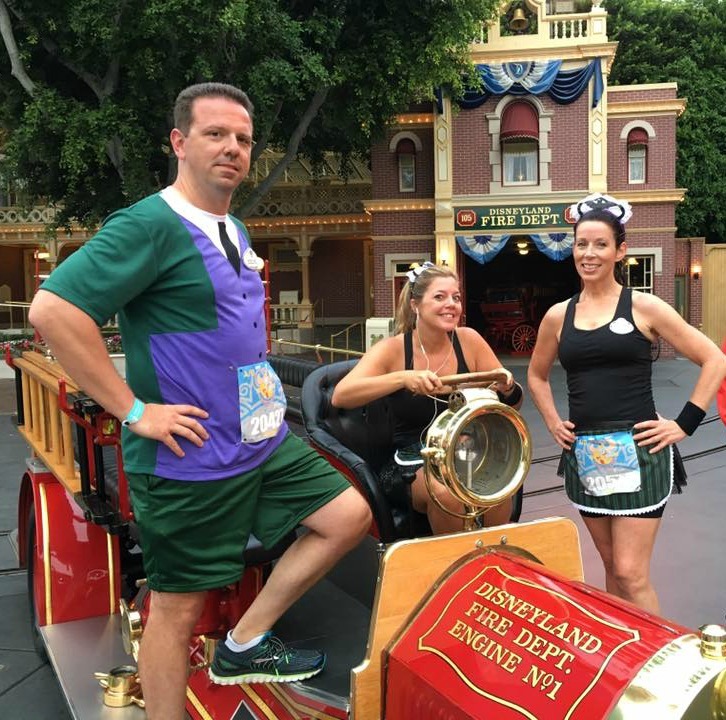 We then proceeded to the front area of the park by Carthay Circle where the Red Trolley was out for a photo op. 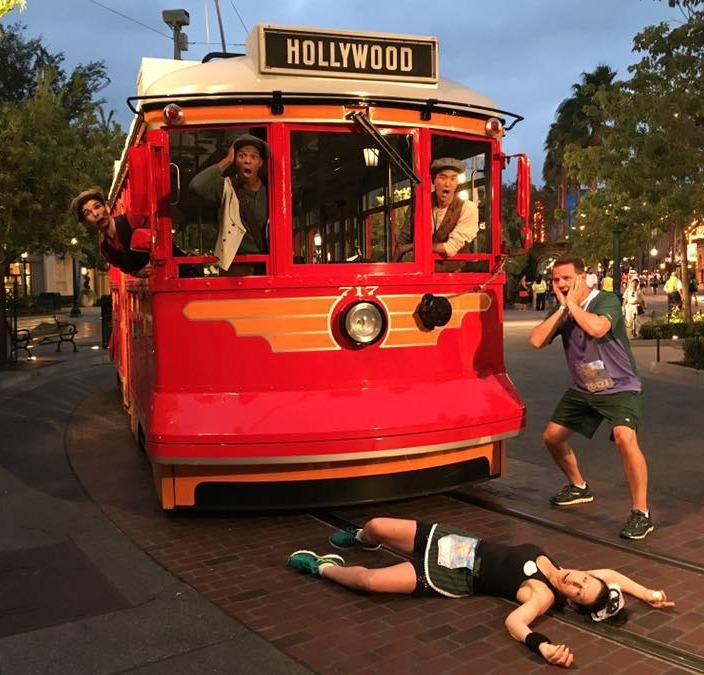 Of course, being who we are, it wouldn’t be a runDisney race if one of us wasn’t getting run over by some sort of transportation! 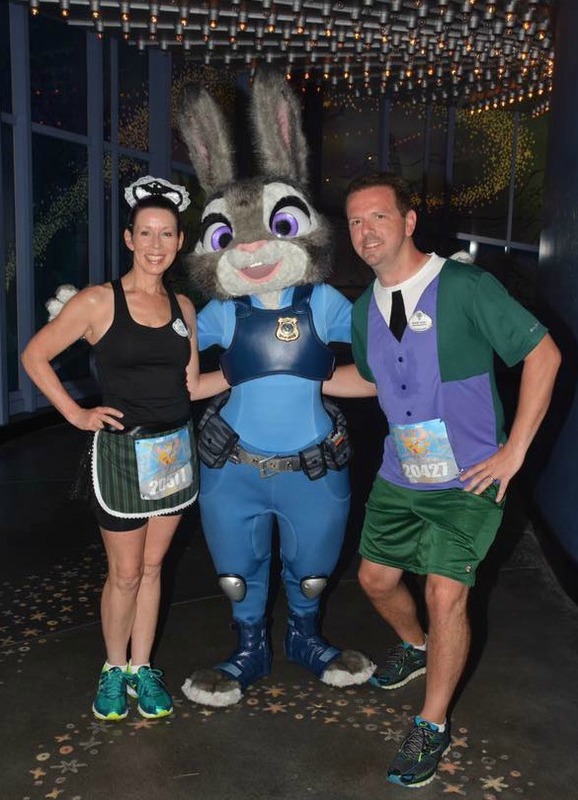 We then shot up Hollywood BLVD, where we found new superstar, Judy Hopps! I still like the one in Hollywood Studios better, but I was still glad we got to enjoy some last moments with California’s version. 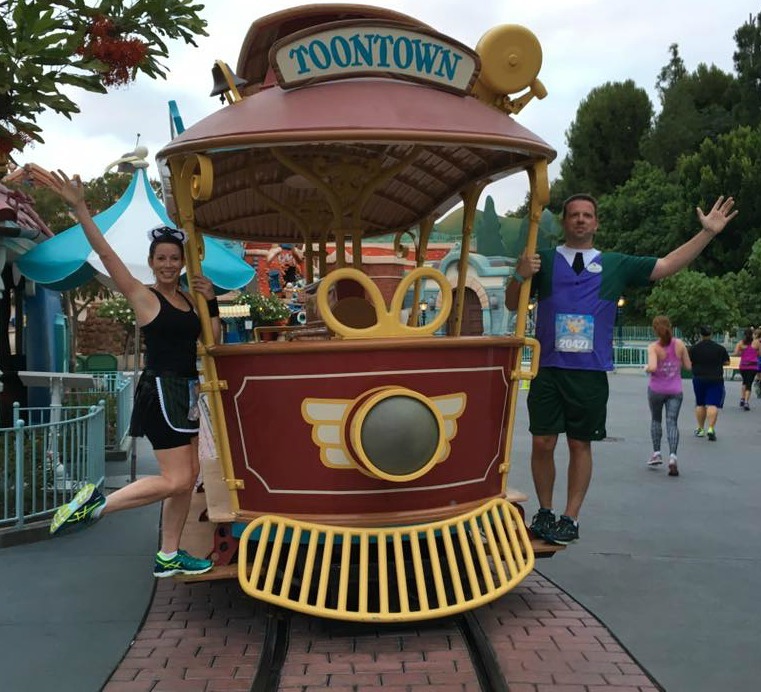 As we exited the park, and passed Mile 4, we made our way through to Disneyland by way of Toon Town. 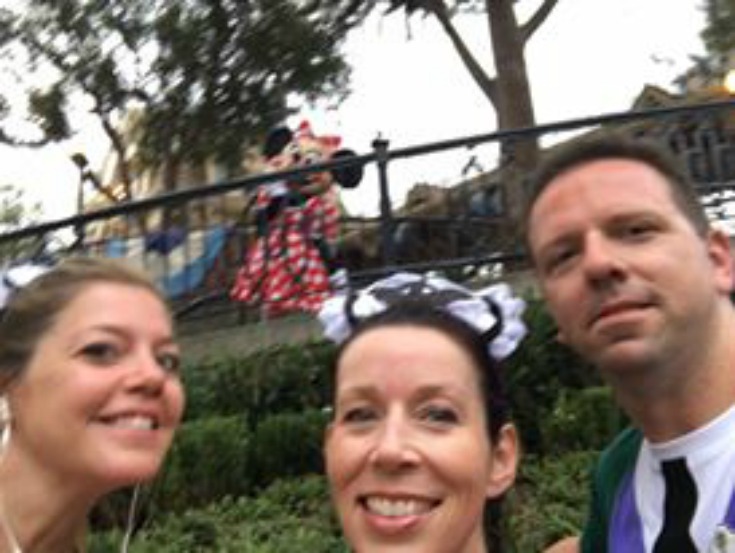 It was at this point that we realized Jackey was not far behind us, so we decided to slow it down (like we could go any slower without actually stopping), and came across Jasmine after passing It’s a Small World, and Mile 5. 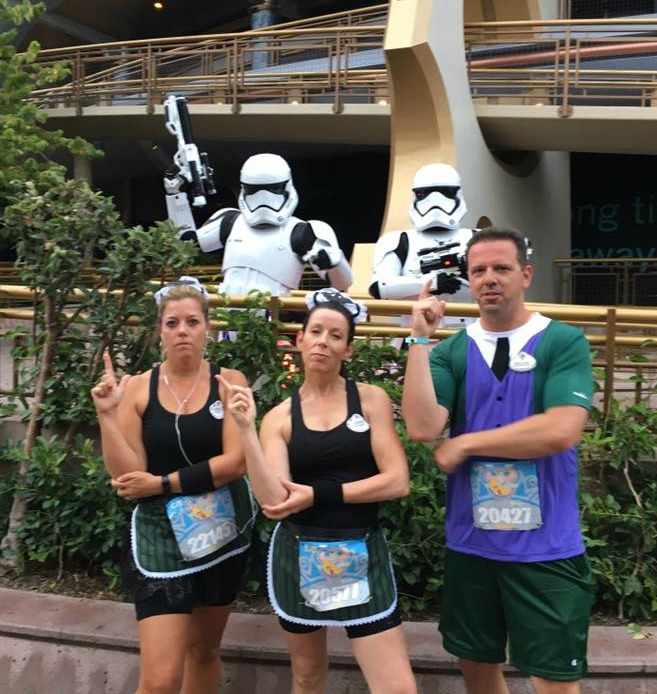 Jackey caught up with us by Tomorrowland, where this always smooth and never awkward trio snapped a picture with some Storm Troopers. 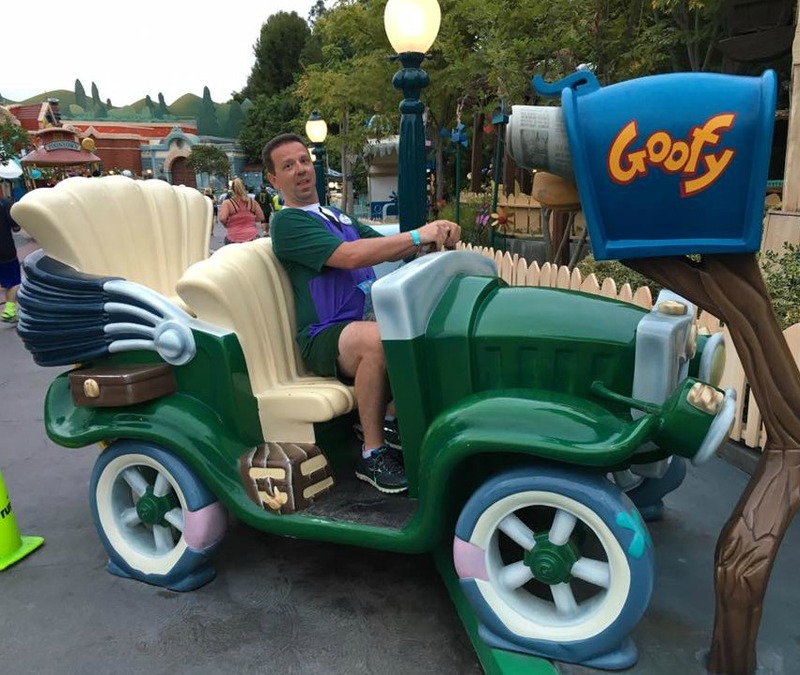 We ran through Fantasyland, where Gepetto was out for selfies, and then made our way through the much smaller, but ever so charming Sleeping Beauty’s Castle. 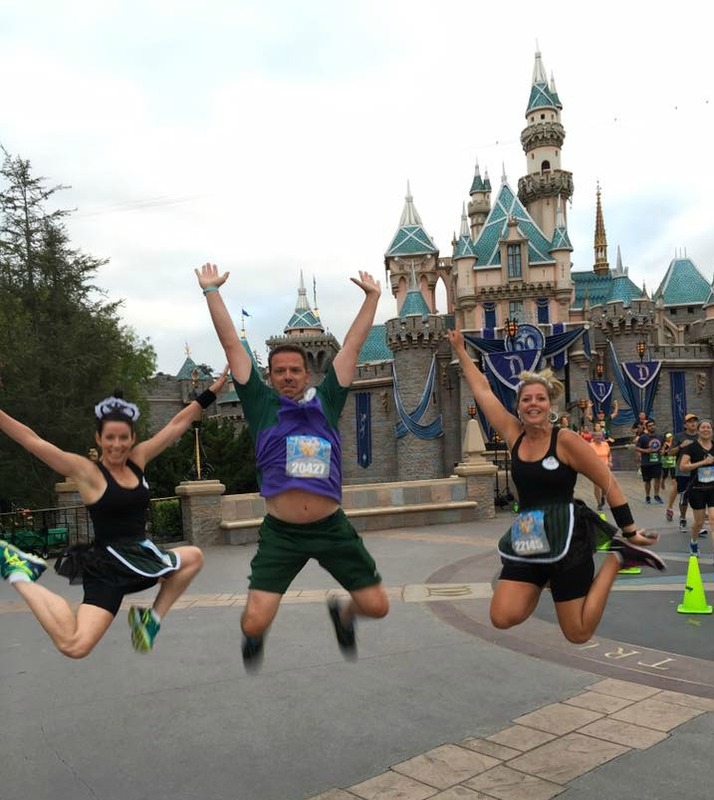 After which, we decided to go for our own #JoyfulJumpshot, which only took about 8 times through the line to finally get right (be on the lookout for the blooper shots, as I have a feeling those will be coming back to haunt me at some point). 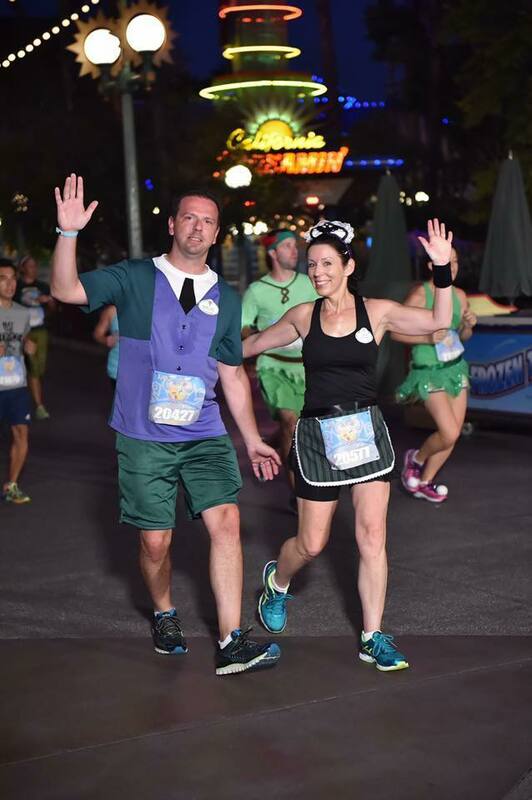 Finally, we exited the park, and were met by a lot of great people cheering us all on as we headed towards the Downtown Disney area and mile 6! It wasn’t much longer that we found our way crossing the finish, for the first time, all together! 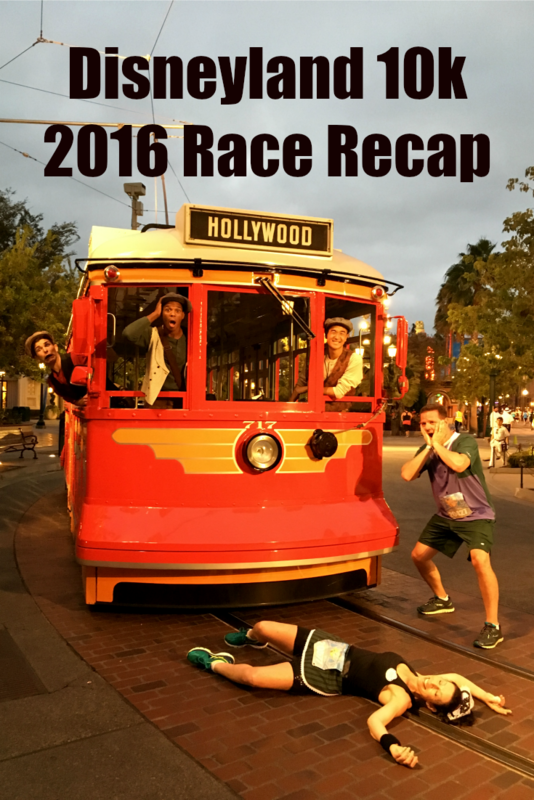 It was now time to reap our reward for completing the race and get our big prize! 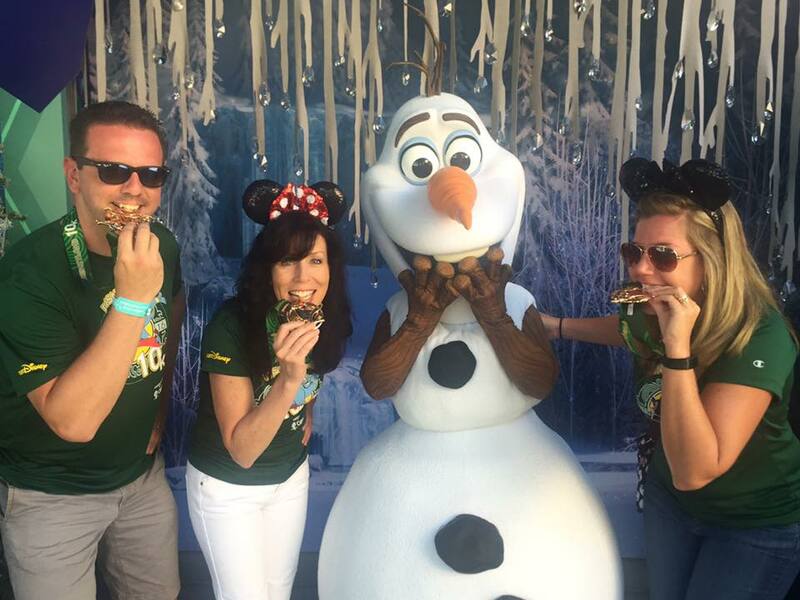 That’s right, the runDisney snack box!! They also give you a medal, which is nice too… I guess. 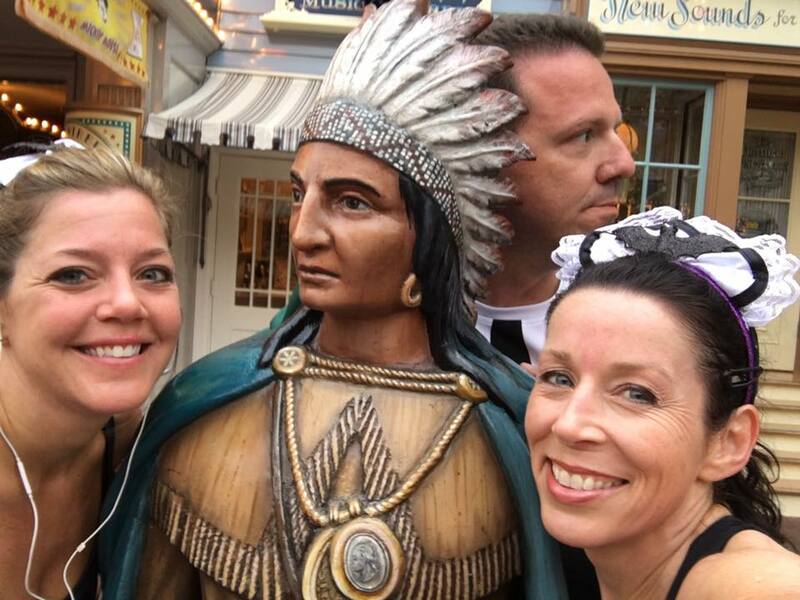 We waited for the rest of our friends to finish and hung out for a bit. At about 8am, we dispersed to get ready for the day. James and I were ready in minutes and hit the parks right away. By the time the girls were all ready, night had fallen. Alright, I kid, I kid. 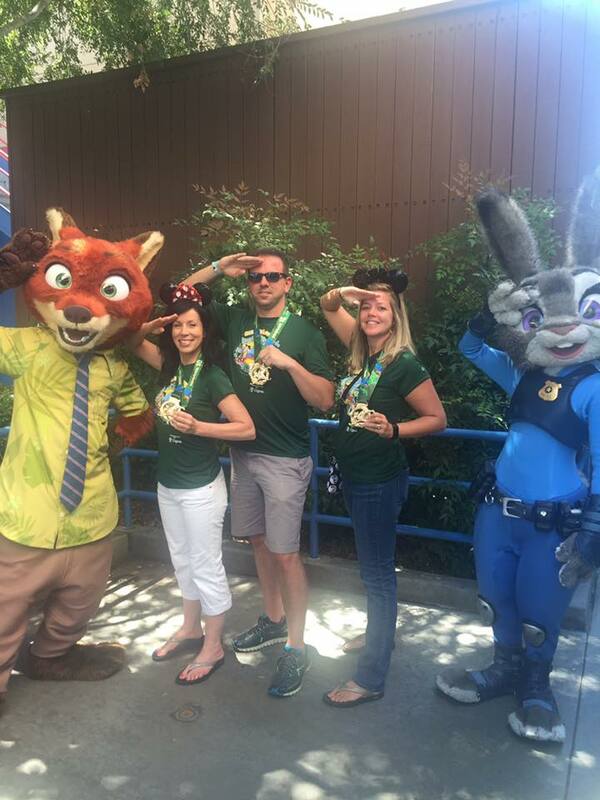 Part of the joy of these races is to show off your medal as you tour the parks, which is exactly what we did! 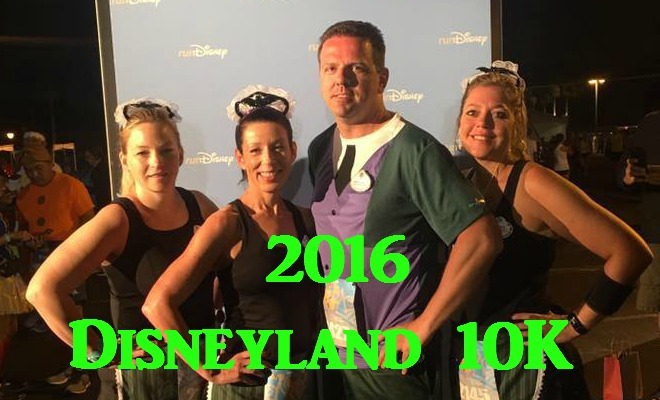 My only other runDisney 10K to compare this to is the Darkside Challenge from this past April, and this competely blew it away! 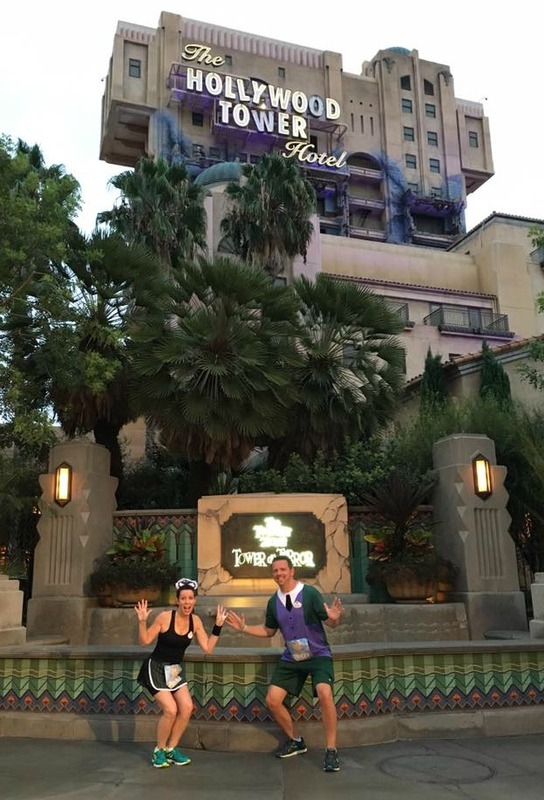 We had so much park time and so many great character interactions and unique photo ops, that this is one I cannot wait to do again. 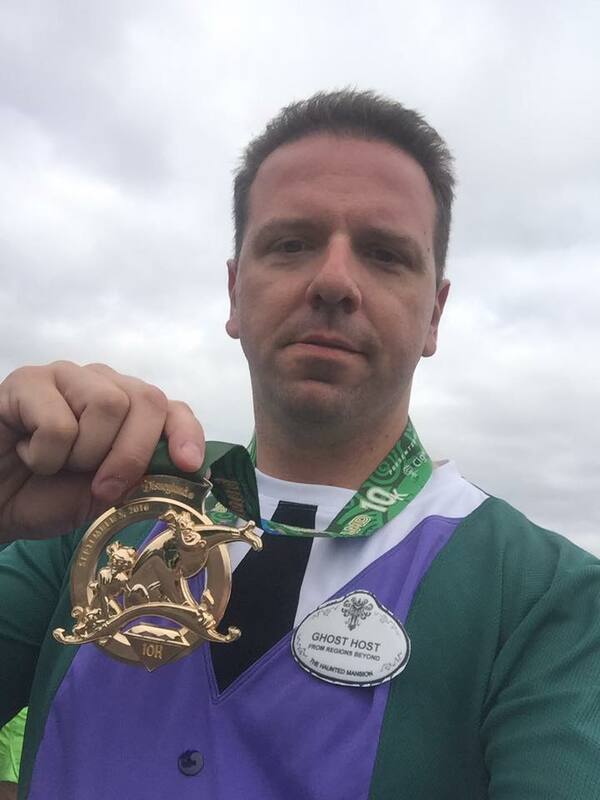 Not having to stress about getting up early and battling transportation problems at the start and finish was a huge relief. 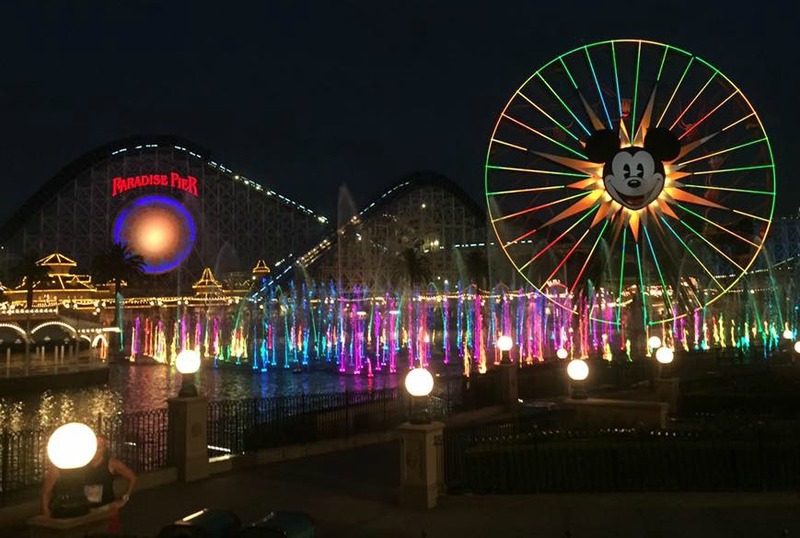 It also helps that California Adventure is now my favorite park, and even though it doesn’t boast as many attractions as a lot of the other parks stateside, it’s themed areas are just so awesome to take in. Especially Cars Land and Paradise Pier! I can’t wait to do this race weekend again, and hopefully catch another Coast to Coast, real soon! How about you? 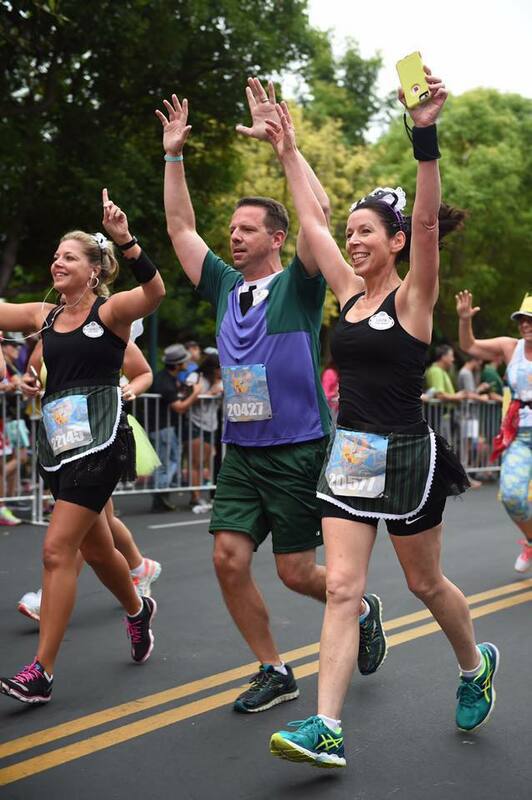 Did any of you run the Disneyland Half Marathon races? We want to know what you think! About the author: Robert is married to a wonderful woman, Lauren, and father of two very cute boys, Seeley and Silas! 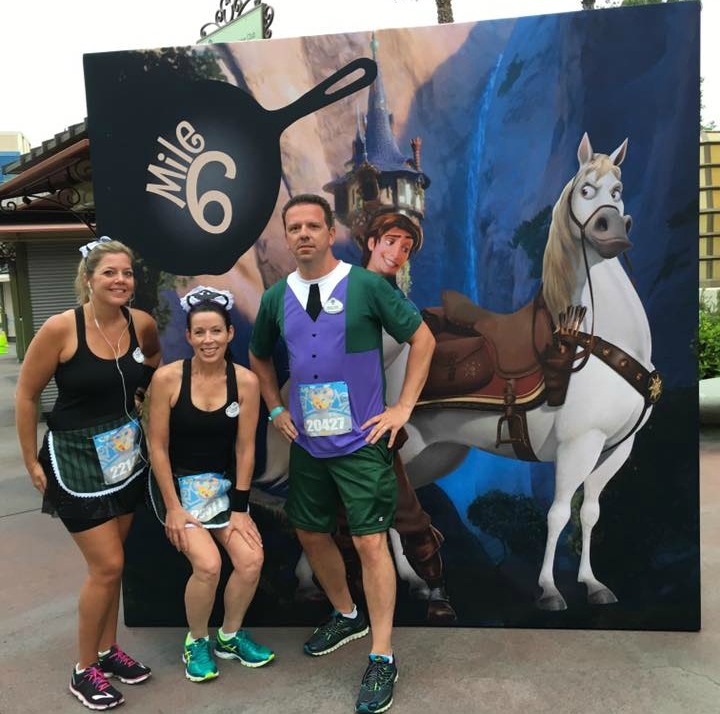 As a total Disney nut who loves to travel, he started running to get in shape, but now he takes vacations so he can run races with the other crazy Joyful Miles ladies! He also loves useless trivia and has a vast knowledge of TV. Go ahead. Ask him anything about Seinfeld! Next post: What’s been up on YouTube!